PGA Tour player Jonathan Byrd always keeps his upper arms close to his body, which keeps his swing more compact. Golf shouldn't be a hard game. Unlike baseball or tennis, the ball doesn't move. Unfortunately, golfers do -- sometimes too much. Many golfers lean away from the ball during their backswing and try to correct it by moving ahead of the ball during the downswing. That leads to another common flaw: golfers jerking their heads up at impact. If you are hitting offline shots, there are ways to correct the flaws. A compact swing reduces this excess movement. Fortunately, there are a few simple ways to tighten up your swing. 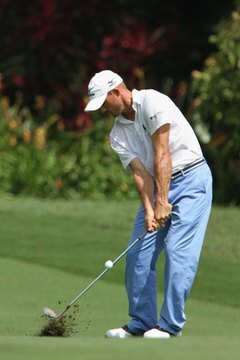 The idea of connection is often attributed to golfing legend Ben Hogan, although in his book, "Five Lessons: The Modern Fundamentals of Golf," he described this in terms of elbow position. Hogan kept his upper arms resting lightly against the sides of his chest during his entire swing. His right arm moved slightly away at the top of his backswing but dropped back into place as he started down. Keeping his arms close to his body this way allowed him to swing down on a consistent plane each time. A connected swing is both compact and powerful. The arms never move far from the body, but the swing never feels cramped. The shoulders turn and the arms feel as if they are just riding along. As she hits the ball, LPGA Tour player Paula Creamer's upper body is still between her feet and not yet over her left leg. Many golfers move their legs and hips too much. They think it will give them a good "weight shift," but all they do is tilt their upper bodies and slide their hips. Your legs and hips form an A-shape at setup. When you swing, neither leg should ever get completely perpendicular to the ground, nor should your shoulders move past either hip, until after the ball is gone. This will keep your upper body between your feet, which improves your balance, and also keeps you from leaning sideways too much. You can still move and turn quite a bit, but the movement will be more compact. Too many golfers try to help the ball into the air. The loft of the club makes the ball go up. All you need to do is swing toward your target. A golf swing is similar to throwing a Frisbee or hitting a tennis ball. The spine angle stays the same while the arms and shoulders just rotate on it. Focus on sending the ball straight toward your target. This will help you stay level throughout your swing, and you won't hit as many thin or fat shots. This might sound overly simple, but a relaxed body keeps your swing more compact. If you're tense, your joints can't bend or straighten smoothly. Instead, you make jerky moves that are much larger than they need to be. Most players make relaxed practice swings; that's why practice swings always look good. A good swing thought is simply to hit the ball with your practice swing.